See and read more easily- anywhere! Glasses are great! They are lightweight, inexpensive & most importantly they don't fall off my face when I bend down. They are really great if you are petite. I purchased these for my elderly father. I could not find 4.0 strength in the store. He is very satisfied with them. The price was reasonable. These are well made. The quality matches the price. I love my glasses they help me read my Bible easily now and are very lightweight. Excellent value ... under $20 for 3 pr! Great value ... less than $20 for 3 pair of glasses .. I mean REALLY ... that's super inexpensive for something that does the job it's supposed to! And small, simple, and stylish as well. The glasses do exactly what is needed with no drawbacks. Excellent value! I use the glasses daily. They are lightweight so they don't bother the nose and leave 'dents' in your skin. I will order these again when I need some. Good price and especially on sale. These glasss are perfect for me. Need strong glasses to see up close, am going to order 325 strength also. Need 400 to see up close and 325 to see far away, I know go to the eye doctor, dont have the money so this is a great alternative. Very light weight and sturdy. Also very affordable!! Perfect magnification, light weight, fast shipping. Such a deal. I've always ordered from your catalogue and find that these glasses last just as long and are just as clear as any others. Dainty looking. Better look for a woman than a man. What can I say, they are glasses. All you do is put them on your face and look through them. I am happy with my purchase. My readers are lightweight and the quality is great! But what I enjoy most about my readers is I can change the color frames, to match what I'm wearing that day, because I have a choice of three colors! Bought these readers for my husband and he loves them! We buy these readers as donation to men's homeless shelter and also for our Christian mission trips to other countries. Always looking for a good bargain but also something that works too. These readers are great and the strength is great. I have never seen this strong before in a discount store before,it's great price and for 3 pairs a good deal I'm going to be buying more again. I use them for all close work . I also ordered a stamp holder dispenser , it's great. I also ordered pearl necklace extenders, love them . Thanks for good products. My husband loves these glasses and we will buy them again.When the lens get too scratched we will replace them from here. It is a bargain price and arrived in a timely manner. These are really great. The prescription glasses I had made have a extremely small reading area. I do not need distance glasses and these reading glasses work great. Plus you have three pair, one on the bed, one by my computer, and one pair in my purse. Always have a pair where I need them. I m very.pleased with the glasses and I intend to buy more . what can I say. they are great and a great bargain. i will definitely be buying more. of them. These are wonderful reading glasses and come in higher magnifications than those available in drugstores, dollar stores or the like. I have multiple pairs, for every room and every purse. They last, too. Have a pair of glasses in more than one spot. Never have to go looking for my readers. Very satisfied. 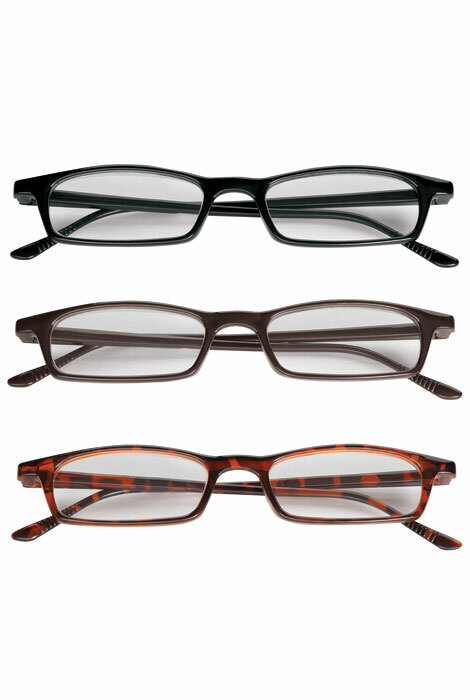 Set of three reading glasses - lightweight, comfortable, and portable. I like to have several pair so I can spread them around the house and in purses. These are a good value. THREE BASIC COLORS GO WITH EVERYTHING. HARD TO FIND STRENGTH W/O PRESCRIPTION. LIGHTWEIGHT AND VERY INEXPENSIVE. These are the next step up from dollar store glasses--and dollar store glasses have been my staple for years; I have prescription glasses which I get through work, and I absolutely can't tell the difference. But I can't find 4x magnification in dollar stores (or in drugstores, for that matter; but these are cheaper than drugstore glasses, anyway). And I like the style as well. I hope they eventually make 5x! Was very pleased with the glasses. These are easy to stuff into a pocket, but seem rather flimsy. If you are looking for glasses to take with you easily, these fit the bill. I love having more than one pair of glasses. I leave them somewhere, but there is always another pair to grab when I need them. that one pair that I need. These are a good price. I can keep a pair in different places where I may need them. overall good product. The frames are somewhat brittle. Would be a great product with stronger frames. I use reading glasses everyday. So it's nice to have multiple pairs to stash around the house when I need them but at this price can't really do that! I would not buy this for family and friends. I will use this product to read up close. They are light. Not what I expected in size. While these are not high quality reading glasses they will work for me. I bought these to keep in places around the house so it would be convenient. I would not use them for every day in my purse. They are good magnifiers. Arms not flexible...I fear of snapping. I ordered 2 sets of 3.50 strength glasses. I received 1 three pack of 3.50 and the other set of three were 3 strength. Very frustrated, but not worth the trouble of returning. I guess that's how the company felt about it also. Was excited to find readers in the higher magnifications because I have monovision and wanted to use these to take the strain off my one eye, but the glasses are too small to fit the head, and I have a 6.5 hat size, so it's not me. When you look at them, they look like children's glasses. Wouldn't buy this product again! Glasses were purchased for an elderly woman. They are flimsy and not useful. They will be thrown in the trash. I realize these glasses were inexpensive, but they should have at least been somewhat as described in the catalog. Will not be purchasing anything else from your catalog. I ordered these as needed some inexpensive readers and they break within a few days of wearing them. You get what you pay for. I super glued the one remaining pair I had before wearing as if you bend them slightly they break and also scratch easily and you cant see out of them. The glasses were extremely small like they were for a child. i need additional readers and this looked like a very good choice. Strength of glasses is hard to find. i couldn't find them in the store. 'Was easy to find item and order. I'm getting older and my eyes continue to decline...and so does my memory as I never can find my glasses. give me a chance to see if 5x will work for me please. Looks to be of good quality. The price was right and I am down to one pair of reading glasses. is a prescription required ? BEST ANSWER: Thank you for your question. A prescription is not needed to order. We hope this information will be of help to you.